During the cold months of December, January and February, (and also usually March and sometimes April) Pittsburgh becomes a winter wonderland. Hat, gloves, scarf, and skis if you're adventurous, are all a must if you're traveling to Pittsburgh! Make sure to pack for cold and snow, but you should also be ready for a possible mild, mid-winter break when temperatures sometimes reach into the 50s and even 60s (when you might need a raincoat). 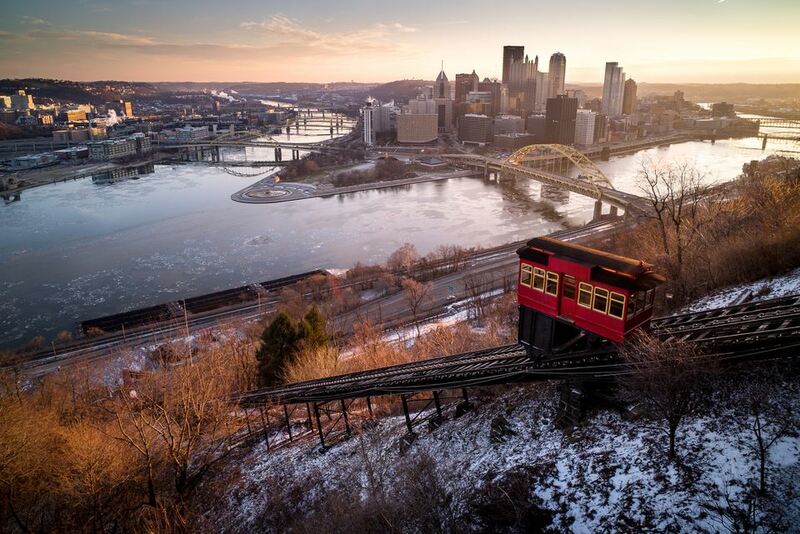 Winters in Pittsburgh aren't as extreme as many people expect. Sure it gets cold here, but lows are generally in the 20s (though they do dip down into the single digits every now and then). Snowfall tends to come just a few inches at a time (the average annual snowfall coming in at 43.5 inches) and local snow removal departments do a pretty good job of keeping the roads cleared and salted. That being said, it's a good idea to pack your snow boots or other sturdy shoes to keep you from slipping around the Steel City! The average high temperatures vary month to be month are drop below freezing by midwinter. The average high for January is 35°F, and the low being a very chilly 19°F. February is a bit warmer, but not by much averaging a high of 38°F and low of 22°F. The old adage that March comes in like a lion and goes out like a lamb is typically (with average highs of 49°F and lows of 30°F) true for Pittsburgh, however, there have been cold temperatures, snow storms, and even blizzards into early April - so be prepared! Whenever you're traveling to a colder climate, it's always wise to bring layers that can be adjusted depending on your environment. It's very typically to have frozen fingers outside and then be whisked away to the tropics the second you go indoors. To combat this, bring warm items like wool sweaters that can easily be taken off and also a few t-shirts or tank tops to wear underneath. A hat that covers your ears is another essential, as are gloves and scarves. If you're very prone to being cold, thermal underwear may be a good option for you ​but may prove to be too hot if you visit later in the winter season. According to the National Weather Service, the largest snowstorm on record for Pittsburgh was 27.4 inches for a storm that lasted from November 24 through 26 in 1950. The greatest snowfall in one day was a whopping 23.6 inches that hit the city on March 13, 1993, and the greatest depth of snow to hit the ground was 26 inches the fell on January 12, 1978. The longest period with at least an inch of snow on the ground was January 8 through March 12 in 1978, and the average annual snowfall hasn't changed much in the past 30 years, frequently coming in around 40 inches per year.